Tattoos have long been a thing of controversy and many have differing opinions on whether or not tattoos should be allowed in the workplace. Considered distractions, unprofessional, even sinful, the list of complaints vary. Many, however, believes tattoos are simply artistic expression. This reporter found many staff members at Cartersville High School sporting a canvas of meaningful, beautiful art. Anyone who has had science teacher, Mrs. Rigsby, knows she has tattoos — eight to be precise. The ones on the tops of her feet, she says, were most painful. Her most valuable, Rigsby says, would probably be a tie. “One is the paw print of my first rescue dog. I got him many years ago and had him for sixteen years. When he passed away, the place that took care of him took an impression of his paw and the tattoo artist took the impression and drew it out.” The other is the one on her forearm — the Irish symbol for motherhood, in essence, a series of hearts that never end. On each side of the symbol she has the initials of her two sons. If you know Mrs. Veiga in Graphic Design, it’s no surprise that her tattoo is a cross over a rainbow. It was done personally by her daughter and Veiga explains, “There’s a lot of significance to it, but everyone knows I love color. There’s been a lot of changes in my life. I got divorced. [At the time of the tattoo] I was engaged. 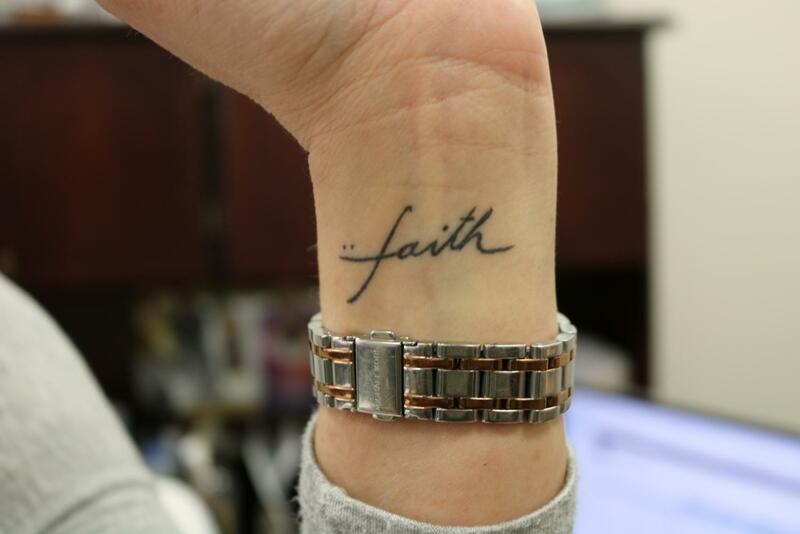 There were a lot of changes going on for the better and all of that was based around our faith.” She and her daughter both got tattoos as a reminder to keep going. Lastly I took to the lunchroom to see if the ladies there had some art of their own. They did not disappoint: one had three tattoos, two had six, and one had thirty eight. Tiffany Tallent, the cafeteria manager, said her most valuable one is on her forearm. It’s her astrology sign (Capricorn) and the constellation of Aries, which is her sobriety date. Along with that, Jessica Lee said the most meaningful to her was the one on her shoulder for her parents who passed away. When asked advice for people considering tattoos, everyone said consider carefully, and because it is permanent, make it meaningful. When all was said and done, all those interviewed said they have never felt judged at CHS for their tattoos. If anything, they said their coworkers ask about their tattoos in a positive manner. Typically, tattoos are more common and more accepted in the workplace now than they once were. The stereotype that people with tattoos are “dangerous” or “scary” is a thing of the past. Tattoos are a beautiful form of self-expression and storytelling. Ask somebody about theirs today. Very good article. Helps me understand tatoos more and why some people choose to express their feelings this way. Ones I have seen on friends and family are very nice.